My cattery name FIN*Lumihelmen was approved by FIFe on September the 1st, 2009. In 2009 I participated basic and advanced courses for cat breeders organized by the Finnish Cat Association. By profession I am a biologist (Ph.D.). We have three race cats in our family. In addition, we have cats living in other families. To our human family belong my husband, our three children and myself. Our race cat hobby started naturally when we had bought our first Europeans. The start of our cat hobby is described on the page "How we became a cat family". Our cattery is located at our home, an old farmhouse in Masku, southwestern Finland. Cats belong to the history of our house. Our cattery name means a snow pearl and is inspired by our oldest cat Helmi, whose name means a pearl and its beautiful registrated name Silkkiturkin Lumia refers to snow (lumi in Finnish). The aims of our breeding are healthy, strong, traditionally beautiful Europeans with a good character. From time to time our desire is to increase genetic variation of European shorthair cats by novice Europeans. When doing this we aim at preserving the vitality of our race. 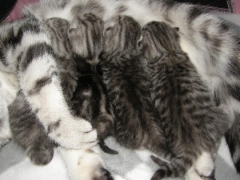 The cats used in our breeding are healthy, FIV as well as FeLV negative and have a good character. Cats belonging to our family are family members with whom we enjoy to spend lovely and relaxing leisure time. The litters which are born/live at our home are involved in our family life. We pay especially much attention on socializing our kittens. Furthermore, we play lots of music at home. So our kittens are experienced music listeners (e.g. brass music tolerant!). Our kittens meet plenty of people and learn to trust humans. This way our kittens can be mostly enjoyed by their new owners.